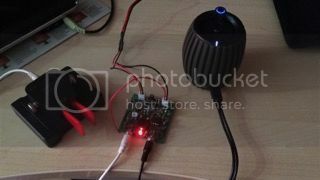 The $4 Chinese Pixie Transceiver. Can you really get on the air for $4? Absolutely! Well, for the transceiver anyway, which in this case will cost you less than the wire to make the antenna. I bought a Chinese Pixie kit for €3.50. That's less than $4, shipping included. Can it even work? Yes. The kit is pretty much as simple as you can make a transceiver. There are two transistors and an audio op amp, three diodes, that's pretty much it. The kit is very easy to assemble and a very good first project. You don't get a keyer, filter, not even a sidetone, but it does receive and transmit on the 40m band. The included crystal is for 7023kHz. When finished I was left with two extra capacitors. I am not even sure of C10, because the one I used had smeared markings, but it doesn't seem to affect anything. The variable resistor supposedly adjusts the frequency slightly but I didn't mess with it. There are no toroids to wind, though I can't understand why anyone would shun doing it as I find it very easy and relaxing. I plugged the kit into my 135ft Windom and started calling. No answer, but a bunch of stations a few hundred miles away reported me on the Reverse Beacon Network, some at 13db over noise floor, which is amazing. 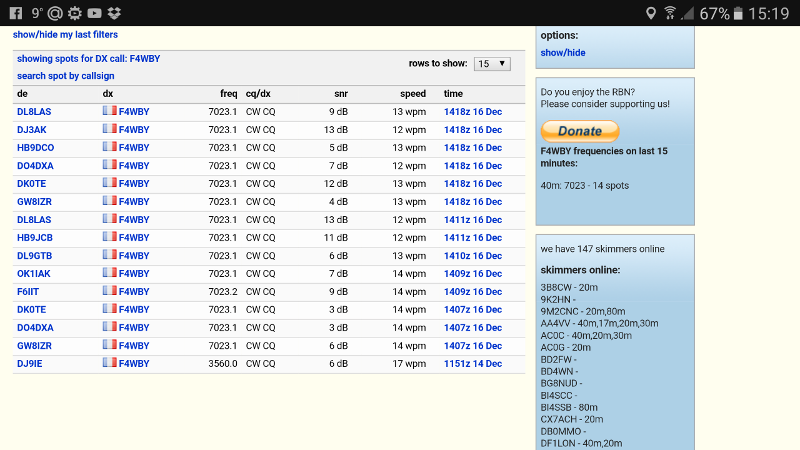 Not bad for a 300-500mW transceiver. I lost my QRP Wattmeter, so until I get a new one I won't know. I will try to make some contacts again when I have time. If you don't mind the lack of keyer and sidetone, this transceiver is pretty good. Some call it "dismal," I wouldn't go that far. Sure, a Rock-Mite beats it, but it's also $50, more than twelve times the cost of the Pixie! Really, for less than the price of a Frappuccino, who would not want to build this kit? It takes no space at all in a bug-out bag and weighs nothing. Add a tiny end-fed tuner, 65ft of thin wire and a 9V battery and you're all set! You can use earphones and a tiny home-made key. 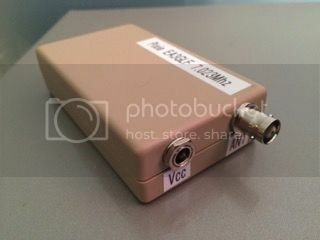 Re: The $4 Chinese Pixie Transceiver. Nice. I remember reading that the Pixie has a cult following with people doing lots of mods. So Gil, I'm curious, did you consider the Frog Sounds rig? I know it's about 3x the cost ($12) but it seems a more capable rig: side tone, almost 2W, volume knob, output filter, real audio amp and super het circuit(I think). So Gil, I'm curious, did you consider the Frog Sounds rig? I called CQ a few times and looked at the Reverse Beacon Network, got reported at 7023.1kHz. I set my KX2 to 7023.1 and started an audio spectrum analyser app on my phone. Tramsmitting with the Pixie I noticed the sidetone was 667Hz. Transmitting on the KX2 I turned the adjustable resistor on the Pixie until the spectrum analyser app showed 667Hz. 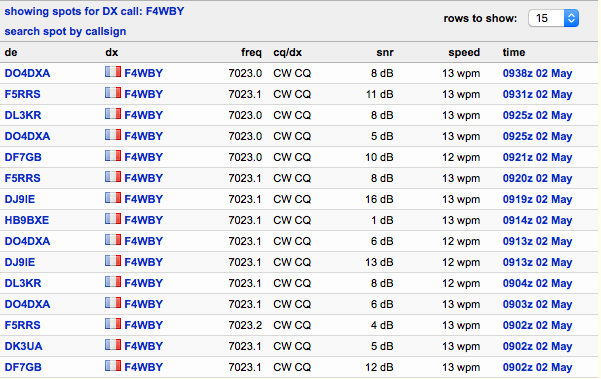 I called CQ on the Pixie, now reported on 7023.0kHz. The adjustable resistor on the Pixie only slightly changes the TX frequency but wildly changes the RX frequency. My goal was to match the two tones so that I am listening to the frequency I transmit on. As a bonus the TX frequency moved down to a perfect 7023kHz. I did not make a contact tonight but it is apparent in the report from the RBN that it isn't a transmission issue but a receiving one. The Pixie having no filter, I could hear so many signals tonight that I could barely decode any single one. I think I heard my call sign returned but couldn't be sure. I guess I'll have to wait for a quieter band. I was thinking of getting a 7030 crystal, but that would make it worse, 7023 is fine, not too crowded. If I was using a magnetic loop antenna I might want the 7030 crystal, but not with a regular antenna. Antenna was my 135ft Windom with dual-core Guanella BALUN, 10m of RG-174 plus 5m of RG-58. Which shows again that the little transceiver has no trouble getting out. I am however not getting any replies. The problem isn't about transmitting but receiving. With no filtering, it is very hard to determine if someone is actually talking to you unless they repeat your call sign... Oh well, it is fun trying! 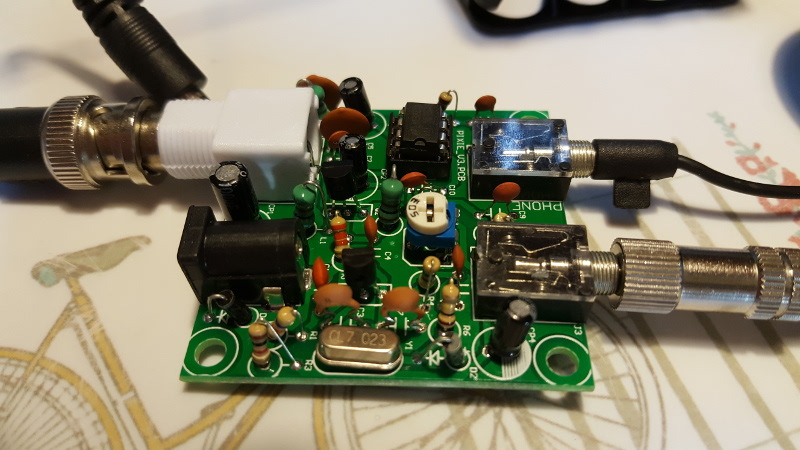 Gill, the New England QRP Group is about to release another run of kits for their NESCAF (switched capacitor filter). 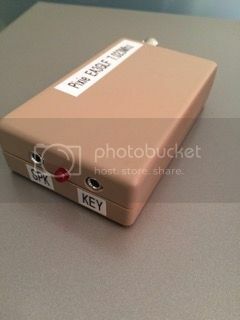 Basically it's an audio filter and speaker driver with knobs for volume(LM386), center frequency (450 - 1,000Hz) and bandwidth (90 - 1,500Hz). The manual says it runs off of 11.5V - 13.8V, but looking at the schematic it will work from about 10.3V to over 15V and should actually be OK on a 9V battery if you bypass the 9V regulator. The manual doesn't mention current draw but I'm eyeballing it at less than 15mA. For some reason they took down the details of the NESCAF, but here's the manual someone posted. I know it's putting makeup on a pig, but I'm getting one for my cheap Chinese kits anyway. It's more about fun than putting makeup on a $4 pig to get it to play like a $100. They say the NESCAF is so good that for fun I'm going to put it inline with my FT-857's audio to see how it compares to its digital filters. 3 euros Pixies are fabulous. People joins two cristal frec with a swith to get two frecs etc. Here you are my pixie, naked and finished. The New England QRP Group has their audio filters available starting June 8. I still haven't built my Frog Sounds or Pixie, but have ordered some 7,030 crystals and will be getting the filter kit (in case they sell out quick). I just sent for a Pixie - The £8 version from an english supplier complete with clear acrylic case, whilst I wait for my uBITX to arrive from India. I'll be using this kit for my Intermediate/2E1*** license practical submission. I still need to build my QRPGuys Iambic key, and come up with a straight key to go with the Pixie. Oh and learn morse so I can use the thing. Great. Watch out for harmonics, the Pixie has no low pass filter... I stopped using mine because I was getting Reverse Beacon Network spots on 20m! 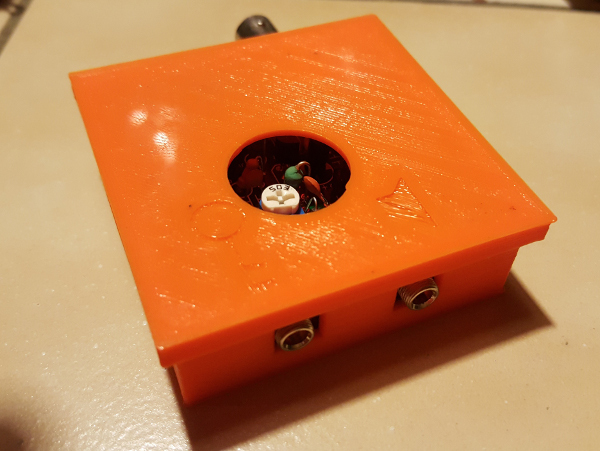 If you are into putting makeup on a pig (kind of fun actually), for about $5 plus shipping you can add one of the QRP guy's 7-pole low pass filter kits to it. Thanks for the heads up Gil. I've also sent for a CW Keyer and beacon kit from Ukraine. The pixie should be here by the end of the week, the Keyer, who knows. I found this phrase funny, it reminds me of a phrase we have here. You can't polish a turd, but you 'can' roll it in glitter.